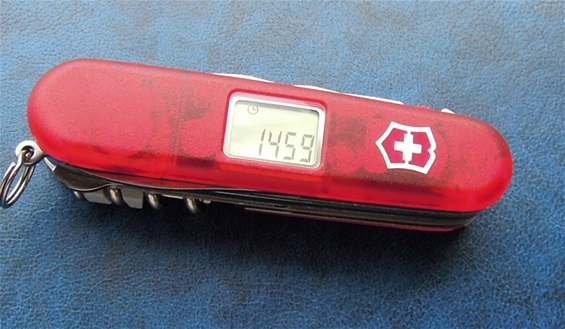 This is a Victorinox knife that has been on my wish-list for some time. It got some serious Tech in the handle scale. The selection of functions and functionality is very high without the electronic devices in the handle scale alone and has many of the functions that are very well known. The electronic functions that are operated by the emblem button by simply pressing with the finger are very interesting. 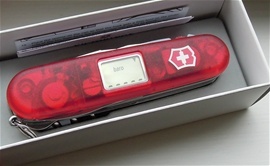 First I can mention the Lite or light function and this is the usual LED module you find on Victorinox products. 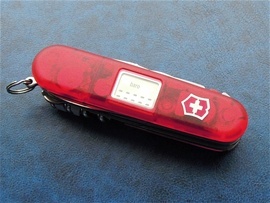 It is a small white light LED with an easy to change battery lid that you open with the tip of the mini screwdriver. This is a small light that is useful for small things. There is also a background light for the display so you can read the digits and functions in the dark. This you can find by pressing the emblem for a few seconds. It will automatically disappear after a short time. 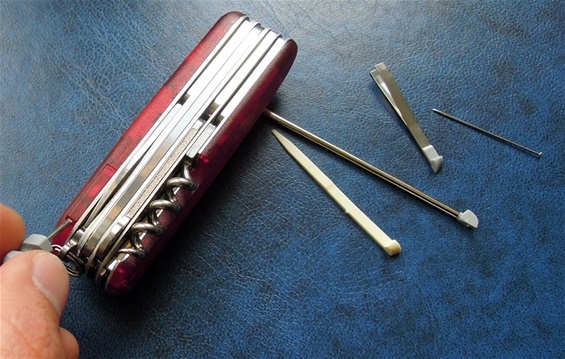 It is very easy to replace the battery by using the tip of the mini-screwdriver and opening the small Lid that got an angled curve and notch for opening. Make sure to place the battery with the correct side like shown in the manual. 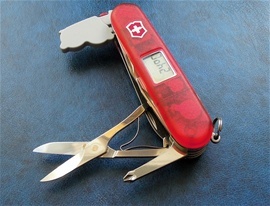 The translucent scales used on these are stronger than the traditional translucent plastic scales used by Victorinox. The emblem is the button for operating all the electronic functions and alterations. By using a simple press or for a short click or by holding it down for a selection of seconds you will be able to adjust, read and alternate information. The manual is helpful and also some information can be found on the internet. From before I know the Voyager model and that is a model I have had for some years. I used it for some time with very good result and I recently managed to get one more Voyager knife for my collection. I recommend if you are not going to use the knife for a long time or just for storage that you remove the battery. 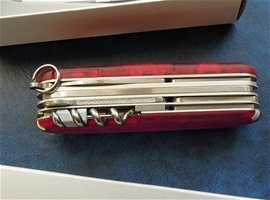 I have already tested the functions on the Traveller Lite and it is not only useful but also fun. The functions are: Watch, Altimeter, Barometer, Alarm, Countdown and Timer. There is a 24h and 12h and you have Celsius and Fahrenheit. 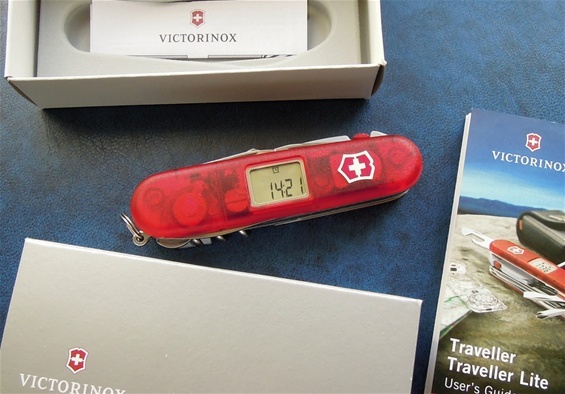 Victorinox is a Company that has gone a long way during the last years with more electronic devices that really is functional. I do not recommend getting the Traveller Lite too wet and make sure that if get soaked or splashed to remove the battery and let the knife dry for a good time before replacing the battery or best a new one. It is a gadget that is functional and not made for too wet environment, that said it most likely takes some anyhow. 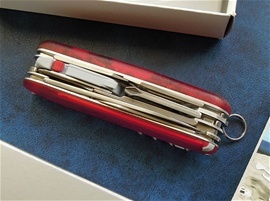 To me it is a type of SAK that fit very well for pocket carry and that you get much use of every day. I calibrated the Altimeter to a known altitude above sea and it was very accurate finding the highest point on the island I live on. So it goes by meter to meter in accuracy. To measure the correct temperature it need some time away from the body temperature to get the very precise measuring. The barometer is fun because atmospheric pressure hPa can be used to tell the coming weather situation. I learned something new today and that is all the years I have lived on this island I never knew the highest point precisely. I read the knife and it said a number that I though was a bit too high. I checked on the Wiki and found it to be very precise. Another nice detail on this knife is that the multi-purpose hook got the spark field or nail-file field on the back. The Traveller Lite is a fairly new model with approx. 3 years or so since introduced. Here the barometer has been even for some hours. A couple of days ago the weather changed and the atmospheric pressure shifted some. The barometer consists of lines that indicate the difference between 3hPa. 3 lines indicate top and 1 line indicates low. When the arrow emerges it is pointing up or down. A couple of days ago there was indicated 2 lines and suddenly only one with the arrow pointing down. This indicated a shift in the weather and correct the next day we got some rain. It works and I already knew that there is some high quality electronics in this. What I learned from this is that the sensor must have abilities that can sense small shifts in the pressure because I have an analog barometer on the wall that indicated a small change too. The SAK actually noticed this shift first. Here the barometer pressure has been even at a lower level. It does not mean that the hPa is at the absolute lowest. It is more the indication that the pressure is a bit lower than the two lines before. It has been even one line for hours. Each step up or down represents 3hPa that should be 1 Hpa = 100 Pa = 1 millibar (x3). Here you see the barometer pressure has been rather even the last hours. The arrow now indicates the pressure falling. This means that the one line is not the lowest possible level because the arrow indicates falling pressure. The barometer is very accurate compared to weather and weather forecast indications. The weather here can be a bit weird at times and therefor I find it interesting to follow the barometer and how it performs. On the top of the picture to the right you see the reading with 3 lines even for hours. Like you know the 3 lines are the maximum number of lines but not the maximum possible pressure because the arrow would indicate further. Yesterday the pressure went down and today we have light rain. Then the pressure developed with rising lines that indicates a rising pressure and possible better weather. I checked the analog one I have and yes it shows a minor rise. All this time I have studied this SAK the difference have been just some Millibar in change. This means that the barometer on the SAK is very fine and the sensor very advanced like I already knew. How it performs was totally unknown to me. I did reset the barometer and it now shows two lines and I will wait for some time to see how it starts again. It was scary accurate. Altitude is also reset to a known one. I know that since this is so accurate that the arrow would be very important to have as the real indicator of changes. I find it a bit interesting that electronic devices or functions are implemented into the SAKs and to see the values implemented as well. On the picture to the right you can see the barometer with a low indication for hours. We have rain. It is important to remember that calibration to a certain place to get the best possible accurate reading is important. At times you get a rise in pressure even if the weather may get worse. I find the barometer very accurate in deed. The Altimeter also has barometric abilities and can be used as an indicator of possible weather changes. The temperature, altimeter and barometer can be used linked to make a certain weather forecast or window. 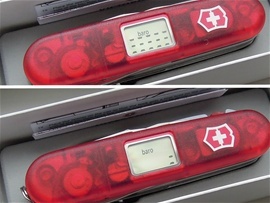 The SAK performs outdoors and indoors the same. In the manual on the internet you can find information and that the millibar and altitude are linked and can be used as indicator. So if one master the three then I would believe it can be a tool with big functionality. In the manual it is also mentioned that the arrow indicates if the changes are persistent or not, the arrow is only showing if the rise or fall is enough to indicate a change. It is typical in a SAK and the history of it that functions can be used together for the best functionality. The Traveller Lite is one of these and the electronic functions can be used single or together. The temperature i set in Celsius and we have mild autumn weather with some rain. I had the SAK inside and it read 22 Degrees Celsius. So I placed it outside to read the outside temperature to compare it to the analog measurer i normally use that reads +11 degrees Celsius and these can have a margin of around +- 1, 5 degrees C. It takes some time for the Traveller Lite digital temperature reader to get the outside measure and it gradually fell towards the correct reading. This is because aluminum, plastic, brass, metal and components will have a delay because of the stored heat. I would believe there are must be some form of compensator vs. certain factors in the electronics and components. It finds the temperature indoors a bit faster. It takes at least some minutes because metal can get cold and steel and aluminum does not follow each other with temperature abilities and so on….The altimeter is influenced by barometric pressure. And the barometer is looking for persistent changes so I would believe the temperature are influenced by other functions and compensations. It is probably looking for a persistent change as well. 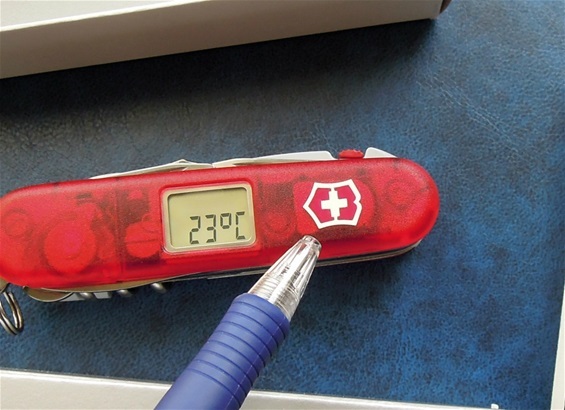 It is a very correct digital temperature on the Traveller Lite and the reading was +11-12 degrees Celsius. Some weather may influence the readings in a special way and electronics may find itself in a problem with what to grab. I have not found one on this yet that said. The only thing is the time it used to find the outdoors temperature like mentioned earlier. I would suggest that the key ring can be a valuable help hanging from a string with a certain protection above it. This is to get a best possible reading. I really enjoy this SAK… I would recommend calibrating the altimeter and barometer when you are outside or inside. 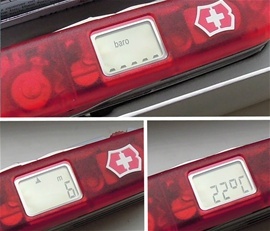 The barometer pressure can be read whether inside or outside. Inside the temperature is very stable compared to outdoors where a sudden drop in temperature may indicate changes better. It must have advanced sensors to distinguish all the factors. Outdoors you have the advantage with the temperature, altimeter and barometer together. It is very normal to have barometers indoors and this may be the best many times with traditional devices. Remember that calibrations on a regular basis are important! I hope you enjoy my little research and let me know if I have any mistakes. I noticed the barometer and altimeter made a change. The barometer rised with 3 lines for hours and the arrow still pointing up. After this the weather is a bit better and the sky a bit lighter. I tested the battery on a tester and it is still good. It does use some battery when testing out all the functions much. My conclusion is that the Traveller Lite is very high quality and it performs. The blades and functions within the SAK i do not need to test since i know them in and out. Everything is 100% ok with my Traveller Lite.